Marketers who grew up with or were converted to the “religion” of direct mail can be a cantankerous, dismissive, and even arrogant bunch when it comes to other forms of advertising. For example, brand or “image” advertising is often viewed as fluff and even a misallocation of valuable budget because of its shotgun distribution and the challenges in measuring its impact. And digital marketing is seen as being dominated by a lot of wet-behind-the-ears technicians who couldn’t write a compelling headline if their smartphone plan depended on it. Yet even the crotchetiest old-school direct marketers have to love what they see in Facebook advertising. Turns out that much of the reason for loving Facebook advertising has to do with what we as direct marketers have always known to be key in the direct mail formula of success—the quality of the list. In direct mail, “list quality” refers to the accuracy with which a marketer reaches its target audience demographics. Hitting the right people is absolutely critical in all advertising because nothing is more important than relevance, and in no channel do marketers have more control of this aspect of a campaign than direct mail. (Yes, still.) Yet, with the penetration of Facebook now hovering around 1.6 BILLION users, a veritable treasure trove of targeting criteria, and users logged in virtually around the clock, Facebook is fast becoming the direct marketer’s dream channel. I should also mention another reason—the (admittedly a bit scary) power of the Facebook pixel, which not only tracks user behavior on Facebook, but also on the web—but discussion of the Facebook pixel warrants its own blog post, so we’ll talk about that another time. 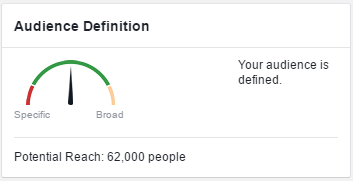 Rather than recount all of the different ways you can target your specific audience on Facebook, a topic which has been very well documented elsewhere, I want to share a real-life case study where a colleague crushed it by using the granular targeting available in Facebook advertising. In this case, my team was working in the online higher education space for a major public university that sought to promote an online bachelor’s completion program in diagnostic imaging. The goal of the campaign was to generate qualified leads for a team of enrollment advisors whose job was to contact and further qualify the leads and convert them to applications for admission into the program. Initial targeting in Facebook focused on relevant clinical job titles, fields and interests, and education levels below the bachelor’s degree level. Clicks were directed to a conversion-focused landing page with an info-request form that included fields for capturing name, contact information (including email and phone), and current education level. While the campaign was producing leads within the budgeted cost per lead (CPL), the CPL had been climbing steadily and the qualified lead rate had dipped below 50 percent in recent months. 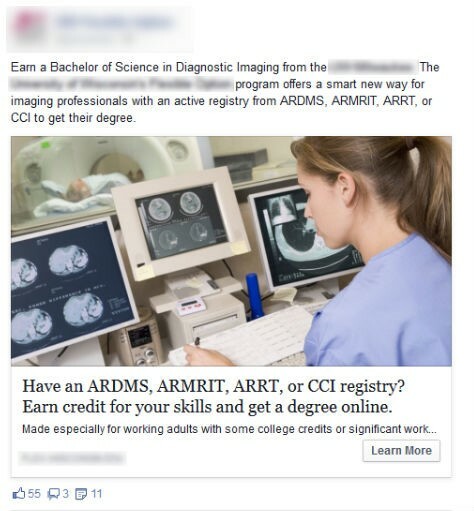 The unique aspect of this campaign was that admission to the bachelor’s completion program, and importantly, the awarding of 60 credits toward the bachelor’s degree, required an active registry with one of four medical imaging organizations, such as the American Registry for Diagnostic Medical Sonography (ARDMS). Active registry meant that the prospect had passed some sort of exam and was recognized by the organization as a qualified professional. The landing page asked for these credentials specifically on the lead form. Normally this would be considered a friction element that would weaken conversion, but in this case, generating qualified leads for recruitment was deemed more important than simple volume. Hence, a lead was only considered qualified if the prospect was active with one of the four registries. Instead of seeing these requirements as a shoulder-shrugging barrier to success, the digital media analyst, who had recently taken over daily management of this account, saw them as an opportunity—an opportunity to drill down into Facebook targeting submenus to find a way to increase the relevance of the campaign. The first step was to find people who already held one of the four required active registries. Could even that level of admittedly obscure detail be found within Facebook? The answer was yes! Targeting at the registry level produced a very relevant audience size of 62,000 across the United States. This tried-and-true copywriting tactic—the question formula—works particularly well when targeting a niche audience, especially one that is tied to a professional organization. 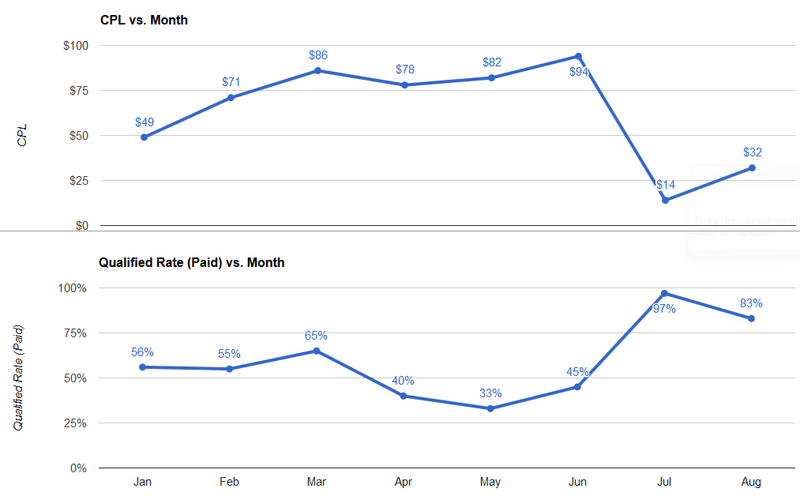 With this relatively simple change in targeting, CPLs dropped 85 percent in one month—from $94 to $14—and the qualified lead rate increased from 45 percent to 97 percent, all without sacrificing the lead volume goal. In fact, this campaign ran so hot that the monthly lead goal was met within a day and had to be dialed back to maintain a manageable lead flow for the enrollment advisors. Facebook advertising for all? Not so fast . . .
Don’t get me wrong—I’m not saying that Facebook will work for every campaign and audience, or that you should eliminate your direct mail budget and go all-in with Facebook. In the above example, we were dealing with one of Facebook’s (and higher education’s) sweet spots: the young to middle-aged female audience. But it’s results like these that get your attention and can make even a grizzled direct mail veteran smile.